An independent publisher and crime writer, Lindy is author of the Kit O’Malley PI trilogy Blood Guilt, Bleeding Hearts and Thicker Than Water; the archaeological mystery Golden Relic; the action thriller, Redback; and the sf crime Feedback. She’s also co-author of the true crime collections Killer in the Family & Murder in the Family (with her sister Fin J Ross); and Women Who Kill (with Ruth Wykes). 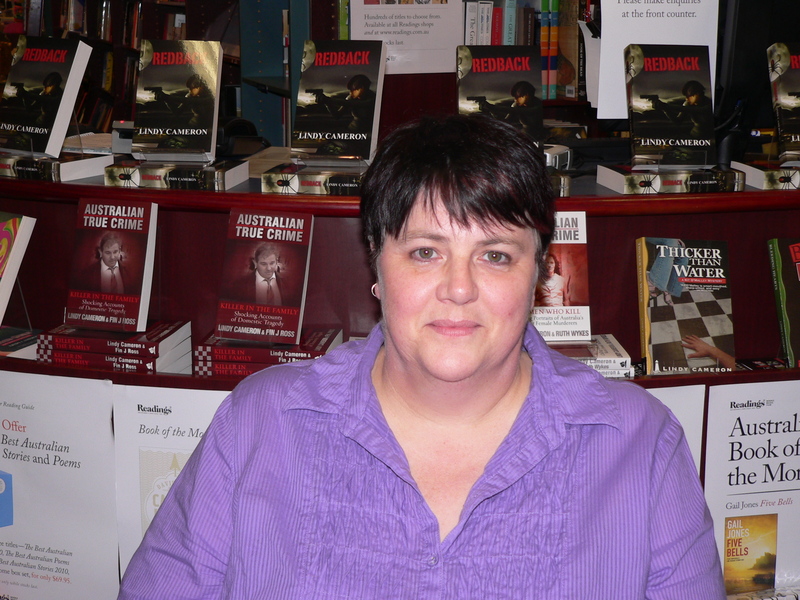 Lindy is a founding member and National Co-Convenor of Sisters in Crime Australia, and the Publisher of Clan Destine Press. 1. You have been involved in many aspects of the writing industry – as a writer, as an anthology editor, and now you have your own press, Clan Destine Press, which aims to publish all kinds of genre fiction, both from new writer and established writers. Since 2010, CDP has produced an impressive array of work, and shows no sign of slowing down. Can you share something about the process by which you set up CDP, and do you have any advice for anyone who’s thinking of beginning their own small press? The start-up process for CDP was to jump from high orbit with untested rocket-boots and no parachute. Since then I’ve been rocketing around like a lunatic collecting authors who are well known in other genres, (with other publishers) and letting them try something different with the Clan. So, we publish the ancient history novels of famous crime writer Kerry Greenwood; and the gritty crime novels of best-selling fantasy writers Rowena Cory Daniells and Alison Goodman. We’ve also adopted some well-known writers and their latest books – Narrelle M Harris, Sandy Curtis, Jane Clifton, Jane Routley, Patricia Bernard, Goldie Alexander. As ‘uncovering new Aussie genre writers’ is one of our prime objectives I’m pleased to say our debut author list is growing too: with urban fantasy already out from Cheryse Durrant and Dean J Anderson; new crime fiction coming from Sandi Wallace and Barry Weston; and new YA specfic from Mary Borsellino. Some of our authors have taken to writing erotica for our Encounters imprint; and Crime Shots, our true crime imprint, is growing. We are also determined to thoroughly thrash the outdated concept of any author’s ‘backlist’ by publishing our authors ‘previous novels’ as CDP front list eBooks. I realise the problem with my rocket-boots was neglecting to factor in a landing pad. My only real advice for anyone starting their own small press is: ‘be prepared to work 24/7’. 2. Several of your books have won major Australian crime fiction awards. What is your opinion on the importance of genre awards to Australian writers and readers? Do you believe that we as a community value our awards enough? Awards are important – if for no other reason than they draw attention to all the contenders. Once we know what books are eligible for the Aurealis or the Davitts every year, we know what we have to catch up on reading. While we don’t write for awards (any more than we write for money) their existence gives us writers a standard to aspire to; and a club to hopefully join one day. 3. What can we expect from you, both on an individual level as a writer, and from CDP, in the future? I am currently working on the sequel to my action thriller Redback; and on a timeshift novel featuring archaeologists and Amazons. It looks like 2015 will be the year of spec-fic and sf for CDP. My coup is the snaffling of Jason Nahrung – he’s mine all mine! – and his awesome outback vampire action duology. There will also be some digital-first space opera from Pete Aldin and Rick Kennet. One of our newest innovations is Clan Destine Fictions which is a digital imprint that allows us to publish short fiction – in every genre – and in any length from a single short story to a novella, to collections of short stories. Jason Nahrung’s Blood & Dust is an incredible action novel that simply oozes the Australian outback; Ellie Marney’s YA crime novel Every Breath is breathtakingly good; and now I’m headlong into Alan Baxter’s excellent Bound. I am living the changes in the publishing industry and trying to make them all work for CDP and my authors. I do wish the indie booksellers who complain about people buying online, would actually commit to stocking and promoting Australian books from Australian (indie) publishers – then the paperback just might survive in a real-world bookshops.